Virus-Like Particles. Hepatitis B Surface and core antigens and Q beta bacteriophage. Dengue. My group's aim is to develop a universal dengue vaccine able to prevent infection by all Dengue virus serotypes and genotypes. We use algorithms to develop new Dengue vaccine candidates based on highly conserved antigens to stimulate cytotoxic T cells. Our work is supported by Innovate UK and Newton Fund. Zika. We have developed a new Zika vaccine using recombinant viruses as platforms, in particular adenovirus. This vaccine has entered GMP production and will be assessed in clinical trials soon. Work is supported by the Department of Health and Innovate UK. Chikungunya. A new vaccine based on recombinant viral vectors has been designed in our group and is currently finishing pre-clinical phase testing and entered clinical trials. These will start in July 2018 and will assess safety and immunogenicity in healthy volunteers in the UK. Malaria. Supported by a Wellcome Trust Fellowship, a new vivax malaria vaccine has been developed, showing outstanding efficacy against pre-erythrocytic malaria infection. A current MRC-DPFS grant is supporting GMP development of this vaccine. Supported by the Newton Fund, Innovate UK and the Nuffield Department of Medicine, we are currently studying immunity against arbovirus (Zika, Dengue and Chikungunya) in volunteers with previous exposure to these pathogens. 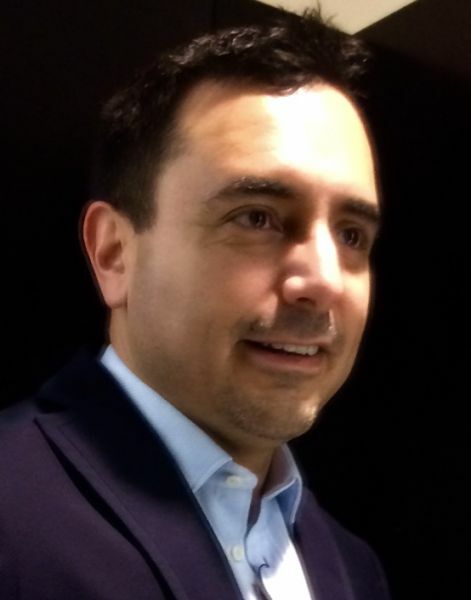 This receives support of research groups in various regions of Mexico (https://www.ndm.ox.ac.uk/mexico/home). Our aim is to understand the way our immune system fights such infections to inform vaccine development. Also, supported by Innovate UK, we aim to carry out a phase Ib trial in Mexico, to assess safety and immunogenicity of our Zika and Chikungunya vaccines in regions affected by these viral infectious diseases. Chikungunya fever (CHIKF) is a mosquito-borne disease caused by Chikungunya virus (CHIKV). This virus is considered a priority pathogen to the UK government, the US National Institute of Allergy and Infectious Diseases (NIAID) and the US military personnel, due to the potential of CHIKV to cause major outbreaks. Nearly all CHIKV infections are symptomatic, often incapacitating and patients experience severe joint pain and inflammation that can last for more than one year with 0.4-0.5% fatality rates. Mother-to-child transmission has also been described. Despite this re-emerging disease has been documented in more than 100 countries in Europe, Oceania, Africa, Asia, the Caribbean, South and North America, no licensed vaccine is yet available to prevent CHIKF. Nevertheless, various developments have entered phase I and II trials and are now viable options to fight this incapacitating disease. This review focuses on the development of CHIKV vaccines that have reached the stage of clinical trials since the late 1960s up until 2018. Malaria remains one the world's most deadly infectious diseases, with almost half a million deaths and over 150 million clinical cases each year. An effective vaccine would contribute enormously to malaria control and will almost certainly be required for eventual eradication of the disease. However, the leading malaria vaccine candidate, RTS,S, shows only 30-50% efficacy under field conditions, making it less cost-effective than long-lasting insecticide treated bed nets. Other subunit malaria vaccine candidates, including TRAP-based vaccines, show no better protective efficacy. This has led to increased interest in combining subunit malaria vaccines as a means of enhancing protective efficacy. Mathematical models of the effect of combining such vaccines on protective efficacy can help inform optimal vaccine strategies and decision-making at all stages of the clinical process. So far, however, no such model has been developed for pre-clinical murine studies, the stage at which all candidate antigens and combinations begin evaluation. To address this gap, this paper develops a mathematical model of vaccine combination adapted to murine malaria studies. The model is based on simple probabilistic assumptions which put the model on a firmer theoretical footing than previous clinical models, which rather than deriving a relationship between immune responses and protective efficacy posit the relationship to be either exponential or Hill curves. Data from pre-clinical murine malaria studies are used to derive values for unknowns in the model which in turn allows simulations of vaccine combination efficacy and suggests optimal strategies to pursue. Finally, the ability of the model to shed light on fundamental biological variables of murine malaria such as the blood stage growth rate and sporozoite infectivity is explored. BACKGROUND: Zika virus (ZIKV) has become a global threat with immediate need for accurate diagnostics, efficacious vaccines and therapeutics. Several ZIKV envelope (Env)-based vaccines have been developed recently. However, many commercially available ZIKV Env are based on the African lineage and produced in insect cells. Here, we sought to produce Asian-lineage ZIKV Env in mammalian cells for research and clinical applications. METHODS: We designed various gene expression constructs to optimize the production of ZIKV using prM-Env and full or C-terminal truncations of Env; with or without a rat CD4 fusion partner to allow large-scale production of soluble protein in mammalian HEK293 cells. Protein expression was verified by mass spectrometry and western-blot with a pan-flavivirus antibody, a ZIKV Env monoclonal antibody and with immune sera from adenoviral (ChAdOx1) ZIKV Env-vaccinated mice. The resulting Env-CD4 was used as a coating reagent for immunoassay (ELISA) using both mouse and human seropositive sera. RESULTS: Replacement of the C-terminus transmembrane Env domain by a rat CD4 and addition of prM supported optimal expression and secretion of Env. Binding between the antigens and the antibodies was similar to binding when using commercially available ZIKV Env reagents. Furthermore, antibodies from ZIKV patients bound ZIKV Env-CD4 in ELISA assays, whereas sera from healthy blood donors yielded minimal OD background. The serological outcomes of this assay correlated also with ZIKV neutralisation capacity in vitro. CONCLUSIONS: Results obtained from this study indicate the potential of the Asian-lineage Zika Env-CD4 and Env proteins in ELISA assays to monitor humoral immune responses in upcoming clinical trials as well as a sero-diagnostic tool in ZIKV infection. INTRODUCTION: The emergence of the Zika virus (ZIKV) in Latin America in 2015-2016 led to an expeditious search for vaccine candidates, with a DNA-based candidate having progressed to Phase II. However, several features of ZIKV infection and epidemiology are not understood, which may be key to maximizing efficacy and ensuring safety of ZIKV vaccines. Areas covered: Conceivable problems related to vaccine development and policy include: (1) paucity of diagnostics to satisfactorily discriminate between past ZIKV and dengue virus (DENV) exposure; (2) insufficient knowledge of the mechanisms of ZIKV neurovirulence, amongst other unknowns in the biology of this infection, is particularly relevant from a vaccine safety perspective; and (3) the potential for disease enhancement, as observed with DENV infection and vaccine. Expert opinion: Vaccine candidates that entered phase I/II trials have demonstrated protection in naïve animal models, while ZIKV epidemics occurred in populations that had encountered DENV before. The resulting cross-reactive antibodies pose problems for reliable serologic diagnostic assays, and for the potential of disease enhancement. The alleged neurological complications also warrant further exploration in order to reassure regulators of the safety profile of these vaccines in target populations. These research aspects should be an integral part of the efforts to develop a vaccine. BACKGROUND: Rodent malaria parasites where the gene encoding circumsporozoite protein (CSP) has been replaced with csp genes from the human malaria parasites, Plasmodium falciparum or Plasmodium vivax, are used as pre-clinical tools to evaluate CSP vaccines in vivo. These chimeric rodent parasites produce sporozoites in Anopheles stephensi mosquitoes that are capable of infecting rodent and human hepatocytes. The availability of chimeric P. falciparum parasites where the pfcsp gene has been replaced by the pvcsp would open up possibilities to test P. vivax CSP vaccines in small scale clinical trials using controlled human malaria infection studies. METHODS: Using CRISPR/Cas9 gene editing two chimeric P. falciparum parasites, were generated, where the pfcsp gene has been replaced by either one of the two major pvcsp alleles, VK210 or VK247. In addition, a P. falciparum parasite line that lacks CSP expression was also generated. These parasite lines have been analysed for sporozoite production in An. stephensi mosquitoes. RESULTS: The two chimeric Pf-PvCSP lines exhibit normal asexual and sexual blood stage development in vitro and produce sporozoite-containing oocysts in An. stephensi mosquitoes. Expression of the corresponding PvCSP was confirmed in oocyst-derived Pf-PvCSP sporozoites. However, most oocysts degenerate before sporozoite formation and sporozoites were not found in either the mosquito haemocoel or salivary glands. Unlike the chimeric Pf-PvCSP parasites, oocysts of P. falciparum parasites lacking CSP expression do not produce sporozoites. CONCLUSIONS: Chimeric P. falciparum parasites expressing P. vivax circumsporozoite protein fail to produce salivary gland sporozoites. Combined, these studies show that while PvCSP can partially complement the function of PfCSP, species-specific features of CSP govern full sporozoite maturation and development in the two human malaria parasites. Vivax malaria remains one of the most serious and neglected tropical diseases, with 132 to 391 million clinical cases per year and 2.5 billion people at risk of infection. A vaccine against Plasmodium vivax could have more impact than any other intervention, and the use of a vaccine targeting multiple antigens may result in higher efficacy against sporozoite infection than targeting a single antigen. Here, two leading P. vivax preerythrocytic vaccine candidate antigens, the P. vivax circumsporozoite protein (PvCSP) and the thrombospondin-related adhesion protein (PvTRAP) were delivered as a combined vaccine. This strategy provided a dose-sparing effect, with 100% sterile protection in mice using doses that individually conferred low or no protection, as with the unadjuvanted antigens PvTRAP (0%) and PvCSP (50%), and reached protection similar to that of adjuvanted components. Efficacy against malaria infection was assessed using a new mouse challenge model consisting of a double-transgenic Plasmodium berghei parasite simultaneously expressing PvCSP and PvTRAP used in mice immunized with the virus-like particle (VLP) Rv21 previously reported to induce high efficacy in mice using Matrix-M adjuvant, while PvTRAP was concomitantly administered in chimpanzee adenovirus and modified vaccinia virus Ankara (MVA) vectors (viral-vectored TRAP, or vvTRAP) to support effective induction of T cells. We examined immunity elicited by these vaccines in the context of two adjuvants approved for human use (AddaVax and Matrix-M). Matrix-M supported the highest anti-PvCSP antibody titers when combined with Rv21, and, interestingly, mixing PvCSP Rv21 and PvTRAP viral vectors enhanced immunity to malaria over levels provided by single vaccines. Vaccine development against Plasmodium vivax malaria lags behind that for Plasmodium falciparum. To narrow this gap, we administered recombinant antigens based on P. vivax circumsporozoite protein (CSP) to mice. We expressed in Pichia pastoris two chimeric proteins by merging the three central repeat regions of different CSP alleles (VK210, VK247, and P. vivax-like). The first construct (yPvCSP-AllFL) contained the fused repeat regions flanked by N- and C-terminal regions. The second construct (yPvCSP-AllCT) contained the fused repeat regions and the C-terminal domain, plus RI region. Mice were vaccinated with three doses of yPvCSP in adjuvants Poly (I:C) or Montanide ISA720. We also used replication-defective adenovirus vectors expressing CSP of human serotype 5 (AdHu5) and chimpanzee serotype 68 (AdC68) for priming mice which were subsequently boosted twice with yPvCSP proteins in Poly (I:C) adjuvant. Regardless of the regime used, immunized mice generated high IgG titres specific to all CSP alleles. After challenge with P. berghei ANKA transgenic parasites expressing Pb/PvVK210 or Pb/PvVK247 sporozoites, significant time delays for parasitemia were observed in all vaccinated mice. These vaccine formulations should be clinically tried for their potential as protective universal vaccine against P. vivax malaria. Microcrystalline Tyrosine (MCT®) is a widely used proprietary depot excipient in specific immunotherapy for allergy. In the current study we assessed the potential of MCT to serve as an adjuvant in the development of a vaccine against malaria. To this end, we formulated the circumsporozoite protein (CSP) of P. vivax in MCT and compared the induced immune responses to CSP formulated in PBS or Alum. Both MCT and Alum strongly increased immunogenicity of CSP compared to PBS in both C57BL/6 and BALB/c mice. Challenge studies in mice using a chimeric P. bergei expressing CSP of P. vivax demonstrated clinically improved symptoms of malaria with CSP formulated in both MCT and Alum; protection was, however, more pronounced if CSP was formulated in MCT. Hence, MCT may be an attractive biodegradable adjuvant useful for the development of novel prophylactic vaccines. The majority of routinely given vaccines require two or three immunisations for full protective efficacy. Single dose vaccination has long been considered a key solution to improving the global immunisation coverage. Recent infectious disease outbreaks have further highlighted the need for vaccines that can achieve full efficacy after a single administration. Viral vectors are a potent immunisation platform, benefiting from intrinsic immuno-stimulatory features while retaining excellent safety profile through the use of non-replicating viruses. We investigated the scope for enhancing the protective efficacy of a single dose adenovirus-vectored malaria vaccine in a mouse model of malaria by co-administering it with vaccine adjuvants. Out of 11 adjuvants, only two, Abisco®-100 and CoVaccineHTTM, enhanced vaccine efficacy and sterile protection following malaria challenge. The CoVaccineHTTM adjuvanted vaccine induced significantly higher proportion of antigen specific central memory CD8+ cells, and both adjuvants resulted in increased proportion of CD8+ T cells expressing the CD107a degranulation marker in the absence of IFNγ, TNFα and IL2 production. Our results show that the efficacy of vaccines designed to induce protective T cell responses can be positively modulated with chemical adjuvants and open the possibility of achieving full protection with a single dose immunisation. The Zika virus (ZIKV) was first isolated in 1947 in Uganda. While it took 60 years for this virus to cause major outbreaks, an important shift in its ability to cause epidemics took place in the first and second decades of the this century: in 2007 in Yap Island, Micronesia, followed by French Polynesia in 2013 and, finally in 2015 and 2016, when ZIKV infections occurred throughout South America, Central America and the Caribbean, spreading rapidly to reach North America in just a single year. No licensed prophylactic vaccine is yet available but recent efforts towards the development of a vaccine have been remarkable from both the private and public sectors and include new candidate vaccines ranging from the classical live-attenuated or inactivated vaccines to more sophisticated approaches such as mRNA or genetically engineered viral platforms. Previous successes with licensed flavivirus vaccines indicate that a protective ZIKV vaccine should be an achievable goal. Nevertheless, numerous pre- and post-licensure challenges need to be taken into account, such as the interaction of vaccine-induced immune responses with other flaviviruses, in particular with dengue, where antibody-dependent enhancement could become an issue, and the importance of a rapid induction of protective responses during pregnancy. Vaccination is the most effective prophylactic tool against infectious diseases. Despite continued efforts to control malaria, the disease still generally represents a significant unmet medical need. Microcrystalline tyrosine (MCT) is a well described depot used in licensed allergy immunotherapy products and in clinical development. However, its proof of concept in prophylactic vaccines has only recently been explored. MCT has never been used in combination with virus-like particles (VLPs), which are considered to be one of the most potent inducers of cellular and humoral immune responses in mice and humans. In the current study we assessed the potential of MCT to serve as an adjuvant in the development of a vaccine against malaria either alone or combined with VLP using Plasmodium vivax thrombospondin-related adhesive protein (TRAP) as a target antigen. We chemically coupled PvTRAP to VLPs derived from the cucumber mosaic virus fused to a universal T-cell epitope of the tetanus toxin (CMVtt), formulated with MCT and compared the induced immune responses to PvTRAP formulated in PBS or Alum. The protective capacity of the various formulations was assessed using Plasmodium berghei expressing PvTRAP. All vaccine formulations using adjuvants and/or VLP increased humoral immunogenicity for PvTRAP compared to the antigen alone. The most proficient responder was the group of mice immunized with the vaccine formulated with PvTRAP-VLP + MCT. The VLP-based vaccine formulated in MCT also induced the strongest T cell response and conferred best protection against challenge with recombinant Plasmodium berghei. Thus, the combination of VLP with MCT may take advantage of the properties of each component and appears to be an alternative biodegradable depot adjuvant for development of novel prophylactic vaccines. Sensitive detection of specific antibodies by biosensors has become of major importance for monitoring and controlling epidemics. Here we report a development of a biosensor able to specifically measure antibodies in a drop of unmodified blood serum. Within minutes, the detection system measures presence of antibodies against Plasmodium vivax, a causing agent for malaria. The biosensor consists of a layer of carbon nanotubes (CNTs) which were casted on a carbon working electrode area of a three-electrode system and oxidized. An amine layer was produced next by modifying the surface with EDAC/NHS followed by reaction with a diamine compound. Finally, the protein fragments derived from P. vivax containing well-known antigen sequences were casted on this layer and bound through electrostatic interactions, involving hydrogen and ionic bonding. All these chemical changes occurring at the carbon surface along the biosensor assembly were followed and confirmed by Fourier Transformed Infrared s pectrometry (FTIR) and Raman spectroscopy. The presence of antibodies in serum was detected by monitoring the electrical properties of the layer, making use of cyclic voltammetry (CV), electrochemical impedance spectroscopy (EIS) and square wave voltammetry (SWV), against a standard iron probe. Overall, the charge-transfer resistance decreased after antibody binding, because there was an additional amount of protein bound to the surface. This hindered the access of the iron redox probe to the conductive support at the electrode surface. Electrical changes could be measured at antibody concentration as low as ~6-50pg/L (concentrations in the range of 10-15M) and as high as ~70μg/L. Specific measurement with low background was even possible in undiluted serum. Hence, this novel biosensor allows assessing serum antibody levels in real time and in un-manipulated serum samples on-site where needed. Development of a protective and broadly-acting vaccine against the most widely distributed human malaria parasite, Plasmodium vivax, will be a major step towards malaria elimination. However, a P. vivax vaccine has remained elusive by the scarcity of pre-clinical models to test protective efficacy and support further clinical trials. In this study, we report the development of a highly protective CSP-based P. vivax vaccine, a virus-like particle (VLP) known as Rv21, able to provide 100% sterile protection against a stringent sporozoite challenge in rodent models to malaria, where IgG2a antibodies were associated with protection in absence of detectable PvCSP-specific T cell responses. Additionally, we generated two novel transgenic rodent P. berghei parasite lines, where the P. berghei csp gene coding sequence has been replaced with either full-length P. vivax VK210 or the allelic VK247 csp that additionally express GFP-Luciferase. Efficacy of Rv21 surpassed viral-vectored vaccination using ChAd63 and MVA. We show for the first time that a chimeric VK210/247 antigen can elicit high level cross-protection against parasites expressing either CSP allele, which provide accessible and affordable models suitable to support the development of P. vivax vaccines candidates. Rv21 is progressing to GMP production and has entered a path towards clinical evaluation. Four different vaccine platforms, each targeting the human malaria parasite Plasmodium vivax cell-traversal protein for ookinetes and sporozoites (PvCelTOS), were generated and assessed for protective efficacy. These platforms consisted of a recombinant chimpanzee adenoviral vector 63 (ChAd63) expressing PvCelTOS (Ad), a recombinant modified vaccinia virus Ankara expressing PvCelTOS (MVA), PvCelTOS conjugated to bacteriophage Qβ virus-like particles (VLPs), and a recombinant PvCelTOS protein expressed in eukaryotic HEK293T cells (protein). Inbred BALB/c mice and outbred CD-1 mice were immunized using the following prime-boost regimens: Ad-MVA, Ad-VLPs, and Ad-protein. 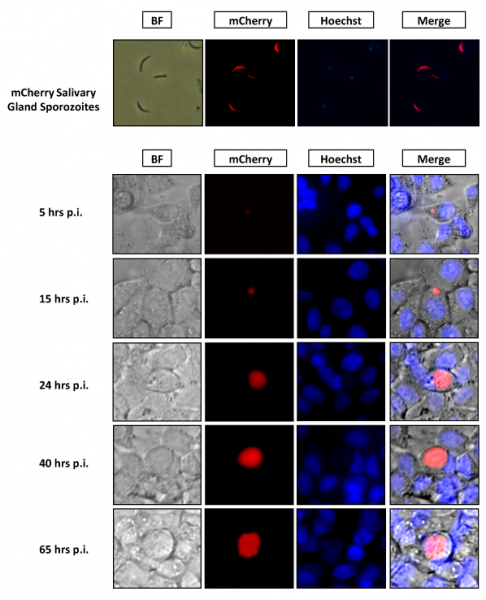 Protective efficacy against sporozoite challenge was assessed after immunization using a novel chimeric rodent Plasmodium berghei parasite (Pb-PvCelTOS). This chimeric parasite expresses P. vivax CelTOS in place of the endogenous P. berghei CelTOS and produces fully infectious sporozoites. A single Ad immunization in BALB/c and CD-1 mice induced anti-PvCelTOS antibodies which were boosted efficiently using MVA, VLP, or protein immunization. PvCelTOS-specific gamma interferon- and tumor necrosis factor alpha-producing CD8+ T cells were induced at high frequencies by all prime-boost regimens in BALB/c mice but not in CD-1 mice; in CD-1 mice, they were only marginally increased after boosting with MVA. Despite the induction of anti-PvCelTOS antibodies and PvCelTOS-specific CD8+ T-cell responses, only low levels of protective efficacy against challenge with Pb-PvCelTOS sporozoites were obtained using any immunization strategy. In BALB/c mice, no immunization regimens provided significant protection against a Pb-PvCelTOS chimeric sporozoite challenge. In CD-1 mice, modest protective efficacy against challenge with chimeric P. berghei sporozoites expressing either PvCelTOS or P. falciparum CelTOS was observed using the Ad-protein vaccination regimen. The cell-traversal protein for ookinetes and sporozoites (CelTOS), a highly conserved antigen involved in sporozoite motility, plays an important role in the traversal of host cells during the preerythrocytic stage of Plasmodium species. Recently, it has been considered an alternative target when designing novel antimalarial vaccines against Plasmodium falciparum. However, the potential of Plasmodium vivax CelTOS as a vaccine target is yet to be explored. This study evaluated the naturally acquired immune response against a recombinant P. vivax CelTOS (PvCelTOS) (IgG and IgG subclass) in 528 individuals from Brazilian Amazon, as well as the screening of B-cell epitopes in silico and peptide assays to associate the breadth of antibody responses of those individuals with exposition and/or protection correlates. We show that PvCelTOS is naturally immunogenic in Amazon inhabitants with 94 individuals (17.8%) showing specific IgG antibodies against the recombinant protein. Among responders, the IgG reactivity indexes (RIs) presented a direct correlation with the number of previous malaria episodes (p = 0.003; r = 0.315) and inverse correlation with the time elapsed from the last malaria episode (p = 0.031; r = -0.258). Interestingly, high responders to PvCelTOS (RI > 2) presented higher number of previous malaria episodes, frequency of recent malaria episodes, and ratio of cytophilic/non-cytophilic antibodies than low responders (RI < 2) and non-responders (RI < 1). Moreover, a high prevalence of the cytophilic antibody IgG1 over all other IgG subclasses (p < 0.0001) was observed. B-cell epitope mapping revealed five immunogenic regions in PvCelTOS, but no associations between the specific IgG response to peptides and exposure/protection parameters were found. However, the epitope (PvCelTOSI136-E143) was validated as a main linear B-cell epitope, as 92% of IgG responders to PvCelTOS were also responders to this peptide sequence. This study describes for the first time the natural immunogenicity of PvCelTOS in Amazon individuals and identifies immunogenic regions in a full-length protein. The IgG magnitude was mainly composed of cytophilic antibodies (IgG1) and associated with recent malaria episodes. The data presented in this paper add further evidence to consider PvCelTOS as a vaccine candidate. Viral-vectored vaccines are in clinical development for several infectious diseases where T-cell responses can mediate protection, and responses to sub-dominant epitopes is needed. Little is known about the influence of MVA or adenoviral vectors on the hierarchy of the dominant and sub-dominant T-cell epitopes. We investigated this aspect in mice using a malaria immunogen. Our results demonstrate that the T-cell hierarchy is influenced by the timing of analysis, rather than by the vector after a single immunization, with hierarchy changing over time. Repeated homologous immunization reduced the breadth of responses, while heterologous prime-boost induced the strongest response to the dominant epitope, albeit with only modest response to the sub-dominant epitopes. Neisseria meningitidis recruits host human complement inhibitors to its surface to down-regulate complement activation and enhance survival in blood. We have investigated whether such complement inhibitor binding occurs after vaccination with native outer membrane vesicles (nOMVs), and limits immunogenicity of such vaccines. To this end, nOMVs reactogenic lipopolysaccharide was detoxified by deletion of the lpxl1 gene (nOMVlpxl1). nOMVs unable to bind human complement factor H (hfH) were generated by additional deletions of the genes encoding factor H binding protein (fHbp) and neisserial surface protein A (NspA) (nOMVdis). Antibody responses elicited in mice with nOMVdis were compared to those elicited with nOMVlpxl1 in the presence of hfH. Results demonstrate that the administration of human fH to mice immunized with fHbp containing OMVlpxl1 decreased immunogenicity against fHbp (but not against the OMV as a whole). The majority of the OMV-induced bactericidal immune response (OMVlpxl1 or OMVdis) was versus PorA. Despite a considerable reduction of hfH binding to nOMVdis, and the absence of the vaccine antigen fHbp, immunogenicity in mice was not different from nOMVlpxl1, in the absence or presence of hfH (serum bactericidal titers of 1:64 vs 1:128 after one dose in the nOMVdis and nOMVlpxl1-immunized groups respectively). Therefore, partial inhibition of fH binding did not enhance immunity in this model. The leading malaria vaccine candidate, RTS,S, based on the Plasmodium falciparum circumsporozoite protein (CSP), will likely be the first publicly adopted malaria vaccine. However, this and other subunit vaccines, such as virus-vectored thrombospondin-related adhesive protein (TRAP), provide only intermediate to low levels of protection. In this study, the Plasmodium berghei homologues of antigens CSP and TRAP are combined. TRAP is delivered using adenovirus- and vaccinia virus-based vectors in a prime-boost regime. Initially, CSP is also delivered using these viral vectors; however, a reduction of anti-CSP antibodies is seen when combined with virus-vectored TRAP, and the combination is no more protective than either subunit vaccine alone. Using an adenovirus-CSP prime, protein-CSP boost regime, however, increases anti-CSP antibody titers by an order of magnitude, which is maintained when combined with virus-vectored TRAP. This combination regime using protein CSP provided 100% protection in C57BL/6 mice compared to no protection using virus-vectored TRAP alone and 40% protection using adenovirus-CSP prime and protein-CSP boost alone. This suggests that a combination of CSP and TRAP subunit vaccines could enhance protection against malaria. Plasmodium vivax is now the dominant Plasmodium species causing malaria in Thailand, yet little is known about naturally acquired immune responses to this parasite in this low-transmission region. The preerythrocytic stage of the P. vivax life cycle is considered an excellent target for a malaria vaccine, and in this study, we assessed the stability of the seropositivity and the magnitude of IgG responses to three different preerythrocytic P. vivax proteins in two groups of adults from a region of western Thailand where malaria is endemic. These individuals were enrolled in a yearlong cohort study, which comprised one group that remained P. vivax free (by quantitative PCR [qPCR] detection, n = 31) and another that experienced two or more blood-stage P. vivax infections during the year of follow up (n = 31). Despite overall low levels of seropositivity, IgG positivity and magnitude were long-lived over the 1-year period in the absence of qPCR-detectable blood-stage P. vivax infections. In contrast, in the adults with two or more P. vivax infections during the year, IgG positivity was maintained, but the magnitude of the response to P. vivax circumsporozoite protein 210 (CSP210) decreased over time. These findings demonstrate that long-term humoral immunity can develop in low-transmission regions. Viral vector vaccines designed to elicit CD8(+) T cells in non-human primates exert potent control of immunodeficiency virus infections; however, similar approaches have been unsuccessful in humans. Adenoviral vectors elicit potent T cell responses but also induce production of immunosuppressive interleukin-10 (IL-10), which can limit the expansion of T cell responses. We investigated whether inhibiting IL-10 signaling prior to immunization with a candidate adenovirus vectored-HIV-1 vaccine, ChAdV63.HIVconsv, could modulate innate and adaptive immune responses in BALB/c mice. Transient IL-10 receptor blockade led to a modest but significant increase in the total magnitude CD8(+) T cell response to HIVconsv, but did not affect T cell responses to immunodominant epitopes. Anti-IL-10R-treated animals also exhibited greater expression of CD86 on CD11c(+) dendritic cells. Our data support further investigation and optimization of IL-10 blocking strategies to improve the immunogenicity of vaccines based on replication-defective adenoviruses. Plasmodium vivax is the world's most widely distributed malaria parasite and a potential cause of morbidity and mortality for approximately 2.85 billion people living mainly in Southeast Asia and Latin America. Despite this dramatic burden, very few vaccines have been assessed in humans. The clinically relevant vectors modified vaccinia virus Ankara (MVA) and the chimpanzee adenovirus ChAd63 are promising delivery systems for malaria vaccines due to their safety profiles and proven ability to induce protective immune responses against Plasmodium falciparum thrombospondin-related anonymous protein (TRAP) in clinical trials. Here, we describe the development of new recombinant ChAd63 and MVA vectors expressing P. vivax TRAP (PvTRAP) and show their ability to induce high antibody titers and T cell responses in mice. In addition, we report a novel way of assessing the efficacy of new candidate vaccines against P. vivax using a fully infectious transgenic Plasmodium berghei parasite expressing P. vivax TRAP to allow studies of vaccine efficacy and protective mechanisms in rodents. Using this model, we found that both CD8+ T cells and antibodies mediated protection against malaria using virus-vectored vaccines. Our data indicate that ChAd63 and MVA expressing PvTRAP are good preerythrocytic-stage vaccine candidates with potential for future clinical application. BACKGROUND: Rift Valley Fever (RVF) is a viral zoonosis that historically affects livestock production and human health in sub-Saharan Africa, though epizootics have also occurred in the Arabian Peninsula. Whilst an effective live-attenuated vaccine is available for livestock, there is currently no licensed human RVF vaccine. Replication-deficient chimpanzee adenovirus (ChAd) vectors are an ideal platform for development of a human RVF vaccine, given the low prevalence of neutralizing antibodies against them in the human population, and their excellent safety and immunogenicity profile in human clinical trials of vaccines against a wide range of pathogens. METHODS: Here, in BALB/c mice, we evaluated the immunogenicity and efficacy of a replication-deficient chimpanzee adenovirus vector, ChAdOx1, encoding the RVF virus envelope glycoproteins, Gn and Gc, which are targets of virus neutralizing antibodies. The ChAdOx1-GnGc vaccine was assessed in comparison to a replication-deficient human adenovirus type 5 vector encoding Gn and Gc (HAdV5-GnGc), a strategy previously shown to confer protective immunity against RVF in mice. RESULTS: A single immunization with either of the vaccines conferred protection against RVF virus challenge eight weeks post-immunization. Both vaccines elicited RVF virus neutralizing antibody and a robust CD8+ T cell response. CONCLUSIONS: Together the results support further development of RVF vaccines based on replication-deficient adenovirus vectors, with ChAdOx1-GnGc being a potential candidate for use in future human clinical trials. Induction of antigen-specific CD8(+) T cells offers the prospect of immunization against many infectious diseases, but no subunit vaccine has induced CD8(+) T cells that correlate with efficacy in humans. Here we demonstrate that a replication-deficient chimpanzee adenovirus vector followed by a modified vaccinia virus Ankara booster induces exceptionally high frequency T-cell responses (median >2400 SFC/10(6) peripheral blood mononuclear cells) to the liver-stage Plasmodium falciparum malaria antigen ME-TRAP. It induces sterile protective efficacy against heterologous strain sporozoites in three vaccinees (3/14, 21%), and delays time to patency through substantial reduction of liver-stage parasite burden in five more (5/14, 36%), P=0.008 compared with controls. The frequency of monofunctional interferon-γ-producing CD8(+) T cells, but not antibodies, correlates with sterile protection and delay in time to patency (P(corrected)=0.005). Vaccine-induced CD8(+) T cells provide protection against human malaria, suggesting that a major limitation of previous vaccination approaches has been the insufficient magnitude of induced T cells. Malaria is one of the few diseases in which morbidity is still measured in hundreds of millions of cases every year. Plasmodium vivax and Plasmodium falciparum are responsible for nearly all the malaria cases in the world and despite difficulties in obtaining an exact number, estimates indicate an astonishing 349-552 million clinical cases of malaria due to P. falciparum in 2007 and between 132-391 million clinical episodes due to P. vivax in 2009. It is becoming evident that eradication of malaria will be an arduous task and P. vivax will be one of the most difficult species to eliminate and perhaps become the last standing malaria parasite. Indeed, in countries that succeed in decreasing the disease burden, nearly all the remaining malaria cases are caused by P. vivax. Such resilience is mainly due to the sophisticated mechanism that the parasite has evolved to remain dormant for months or years forming hypnozoites, a small structure in the liver that will be a major hurdle in the efforts toward malaria eradication. Furthermore, while clinical trials of vaccines against P. falciparum are making fast progress, a very different picture is seen with P. vivax, where only few candidates are currently active in clinical trials. Tuberculosis (TB) is a reemerging disease. The only available vaccine, Mycobacterium bovis BCG, is delivered intradermally and confers highly variable efficacy against pulmonary disease. There is an urgent need for improved vaccination strategies. Murine studies suggest that immunizations delivered directly to the respiratory mucosa might be a more effective route of vaccination. This study compared the immunogenicity of a leading candidate tuberculosis (TB) vaccine, modified vaccinia virus Ankara expressing antigen 85A (MVA85A), in rhesus macaques, delivered either as an aerosol or as an intradermal boost immunization 12 weeks after an intradermal BCG prime vaccine. Aerosol vaccination was well tolerated. MVA85A delivered by aerosol or by intradermal injection induced antigen-specific immune responses in the periphery and the lung, with a trend toward the highest response when the compartment and route of delivery were matched. The ability of poxvirus-vectored vaccines delivered by the systemic route to induce responses in the mucosal immune compartment in macaques is in contrast to the independent compartmentalization of mucosal and systemic immune systems described in mice. Unlike intradermal vaccination, aerosol vaccination did not induce a detectable serum anti-vector antibody response. The delivery of vaccines to the lungs might provide an immunization strategy that limits the induction of systemic anti-vector immunity, which would be extremely useful in the development of improved vaccine strategies. This is the first study to show a recombinant MVA-vectored vaccine to be highly immunogenic when delivered by the aerosol route to nonhuman primates. These results provide important safety and proof-of-concept data for further evaluation of this route of immunization for use in human clinical trials. The Bacillus Calmette - Guerin (BCG) vaccine provides a critical but limited defense against Mycobacterium tuberculosis (M.tb). More than 60 years after the widespread introduction of BCG, there is an urgent need for a better vaccine. A large body of pre-clinical research continues to support ongoing clinical trials to assess whether viral vectors expressing M.tb antigens that are shared by BCG and M.tb, can be used alongside BCG to enhance protection. A major focus involves using multiple unique viral vectors to limit anti-vector immunity and thereby enhance responses to the insert antigen delivered. The successful introduction of viral vector vaccines to target M.tb and other pathogens will be reliant on reducing the costs when using multiple vectors and inhibiting the development of unwanted anti-vector responses that interfere with the response to insert antigen. This study examines methods to reduce the logistical costs of vaccination by mixing different viral vectors that share the same insert antigen in one vaccine; and whether combining different viral vectors reduces anti-vector immunity to improve immunogenicity to the insert antigen. Here we show that a homologous prime-boost regimen with a mixture of MVA (Modified Vaccinia virus Ankara) and Ad5 (human adenovirus type 5) vectors both expressing Ag85A in a single vaccine preparation is able to reduce anti-vector immunity, compared with a homologous prime-boost regimen with either vector alone. However, the level of immunogenicity induced by the homologous mixture remained comparable to that induced with single viral vectors and was less immunogenic than a heterologous Ad5 prime-MVA-boost regimen. These findings advance the understanding of how anti-vector immunity maybe reduced in viral vector vaccination regimens. Furthermore, an insight is provided to the impact on vaccine immunogenicity from altering vaccination methods to reduce the logistical demands of using separate vaccine preparations in the field. Most subunit vaccines require adjuvants in order to induce protective immune responses to the targeted pathogen. However, many of the potent immunogenic adjuvants display unacceptable local or systemic reactogenicity. Liposomes are spherical vesicles consisting of single (unilamellar) or multiple (multilamellar) phospholipid bi-layers. The lipid membranes are interleaved with an aqueous buffer, which can be utilised to deliver hydrophilic vaccine components, such as protein antigens or ligands for immune receptors. Liposomes, in particular cationic DDA:TDB vesicles, have been shown in animal models to induce strong humoral responses to the associated antigen without increased reactogenicity, and are currently being tested in Phase I human clinical trials. We explored several modifications of DDA:TDB liposomes--including size, antigen association and addition of TLR agonists--to assess their immunogenic capacity as vaccine adjuvants, using Ovalbumin (OVA) protein as a model protein vaccine. Following triple homologous immunisation, small unilamellar vesicles (SUVs) with no TLR agonists showed a significantly higher capacity for inducing spleen CD8 IFNγ responses against OVA in comparison with the larger multilamellar vesicles (MLVs). Antigen-specific antibody reponses were also higher with SUVs. Addition of the TLR3 and TLR9 agonists significantly increased the adjuvanting capacity of MLVs and OVA-encapsulating dehydration-rehydration vesicles (DRVs), but not of SUVs. Our findings lend further support to the use of liposomes as protein vaccine adjuvants. Importantly, the ability of DDA:TDB SUVs to induce potent CD8 T cell responses without the need for adding immunostimulators would avoid the potential safety risks associated with the clinical use of TLR agonists in vaccines adjuvanted with liposomes. Substantial protection can be provided against the pre-erythrocytic stages of malaria by vaccination first with an adenoviral and then with an modified vaccinia virus Ankara (MVA) poxviral vector encoding the same ME.TRAP transgene. We investigated whether the two vaccine components adenovirus (Ad) and MVA could be coinjected as a mixture to enhance protection against malaria. A single-shot mixture at specific ratios of Ad and MVA (Ad+MVA) enhanced CD8(+) T cell-dependant protection of mice against challenge with Plasmodium berghei. Moreover, the degree of protection could be enhanced after homologous boosting with the same Ad+MVA mixture to levels comparable with classic heterologous Ad prime-MVA boost regimes. The mixture increased transgene-specific responses while decreasing the CD8(+) T cell antivector immunity compared to each vector used alone, particularly against the MVA backbone. Mixed vector immunization led to increased early circulating interferon-γ (IFN-γ) response levels and altered transcriptional microarray profiles. Furthermore, we found that sequential immunizations with the Ad+MVA mixture led to consistent boosting of the transgene-specific CD8(+) response for up to three mixture immunizations, whereas each vector used alone elicited progressively lower responses. Our findings offer the possibility of simplifying the deployment of viral vectors as a single mixture product rather than in heterologous prime-boost regimens. Vaccination using "naked" DNA is a highly attractive strategy for induction of pathogen-specific immune responses; however, it has been only weakly immunogenic in humans. Previously, we constructed DNA-launched Semliki Forest virus replicons (DREP), which stimulate pattern recognition receptors and induce augmented immune responses. Also, in vivo electroporation was shown to enhance immune responses induced by conventional DNA vaccines. Here, we combine these two approaches and show that in vivo electroporation increases CD8(+) T cell responses induced by DREP and consequently decreases the DNA dose required to induce a response. The vaccines used in this study encode the multiclade HIV-1 T cell immunogen HIVconsv, which is currently being evaluated in clinical trials. Using intradermal delivery followed by electroporation, the DREP.HIVconsv DNA dose could be reduced to as low as 3.2 ng to elicit frequencies of HIV-1-specific CD8(+) T cells comparable to those induced by 1 μg of a conventional pTH.HIVconsv DNA vaccine, representing a 625-fold molar reduction in dose. Responses induced by both DREP.HIVconsv and pTH.HIVconsv were further increased by heterologous vaccine boosts employing modified vaccinia virus Ankara MVA.HIVconsv and attenuated chimpanzee adenovirus ChAdV63.HIVconsv. Using the same HIVconsv vaccines, the mouse observations were supported by an at least 20-fold-lower dose of DNA vaccine in rhesus macaques. These data point toward a strategy for overcoming the low immunogenicity of DNA vaccines in humans and strongly support further development of the DREP vaccine platform for clinical evaluation. BACKGROUND: Vaccine development in human Plasmodium falciparum malaria has been hampered by the exceptionally high levels of CD8(+) T cells required for efficacy. Use of potently immunogenic human adenoviruses as vaccine vectors could overcome this problem, but these are limited by preexisting immunity to human adenoviruses. METHODS: From 2007 to 2010, we undertook a phase I dose and route finding study of a new malaria vaccine, a replication-incompetent chimpanzee adenovirus 63 (ChAd63) encoding the preerythrocytic insert multiple epitope thrombospondin-related adhesion protein (ME-TRAP; n = 54 vaccinees) administered alone (n = 28) or with a modified vaccinia virus Ankara (MVA) ME-TRAP booster immunization 8 weeks later (n = 26). We observed an excellent safety profile. High levels of TRAP antigen-specific CD8(+) and CD4(+) T cells, as detected by interferon γ enzyme-linked immunospot assay and flow cytometry, were induced by intramuscular ChAd63 ME-TRAP immunization at doses of 5 × 10(10) viral particles and above. Subsequent administration of MVA ME-TRAP boosted responses to exceptionally high levels, and responses were maintained for up to 30 months postvaccination. CONCLUSIONS: The ChAd63 chimpanzee adenovirus vector appears safe and highly immunogenic, providing a viable alternative to human adenoviruses as vaccine vectors for human use. CLINICAL TRIALS REGISTRATION: NCT00890019. Substantial protection can be provided against the pre-erythrocytic stages of malaria by vaccination first with an adenoviral and then with an modified vaccinia virus Ankara (MVA) poxviral vector encoding the same ME.TRAP transgene. We investigated whether the two vaccine components adenovirus (Ad) and MVA could be coinjected as a mixture to enhance protection against malaria. A single-shot mixture at specific ratios of Ad and MVA (AdMVA) enhanced CD8 ++ T cell-dependant protection of mice against challenge with Plasmodium berghei. Moreover, the degree of protection could be enhanced after homologous boosting with the same AdMVA mixture to levels comparable with classic heterologous Ad prime-MVA boost regimes. The mixture increased transgene-specific responses while decreasing the CD8++ T cell antivector immunity compared to each vector used alone, particularly against the MVA backbone. Mixed vector immunization led to increased early circulating interferon-γ (IFN-γ) response levels and altered transcriptional microarray profiles. Furthermore, we found that sequential immunizations with the AdMVA mixture led to consistent boosting of the transgene-specific CD8++ response for up to three mixture immunizations, whereas each vector used alone elicited progressively lower responses. Our findings offer the possibility of simplifying the deployment of viral vectors as a single mixture product rather than in heterologous prime-boost regimens. © The American Society of Gene & Cell Therapy. Identification of correlates of protection for infectious diseases including malaria is a major challenge and has become one of the main obstacles in developing effective vaccines.We investigated protection against liver-stage malaria conferred by vaccination with adenoviral (Ad) and modified vaccinia Ankara (MVA) vectors expressing pre-erythrocytic malaria Ags. By classifying CD8+ T cells into effector, effector memory (TEM), and central memory subsets using CD62L and CD127 markers, we found striking differences in T cell memory generation. Although MVA induced accelerated central memory T cell generation, which could be efficiently boosted by subsequent Ad administration, it failed to protect against malaria. In contrast, Ad vectors, which permit persistent Ag delivery, elicit a prolonged effector T cell and TEM response that requires long intervals for an efficient boost. A preferential TEM phenotype was maintained in liver, blood, and spleen after Ad/MVA prime-boost regimens, and animals were protected against malaria sporozoite challenge. Blood CD8+ TEM cells correlated with protection against malaria liver-stage infection, assessed by estimation of number of parasites emerging from the liver into the blood. The protective ability of Agspecific TEM cells was confirmed by transfer experiments into naive recipient mice. Thus, we identify persistent CD8 TEMpopulations as essential for vaccine-induced pre-erythrocytic protection against malaria, a finding that has important implications for vaccine design. Copyright © 2011 by The American Association of Immunologists, Inc. Identification of correlates of protection for infectious diseases including malaria is a major challenge and has become one of the main obstacles in developing effective vaccines. We investigated protection against liver-stage malaria conferred by vaccination with adenoviral (Ad) and modified vaccinia Ankara (MVA) vectors expressing pre-erythrocytic malaria Ags. 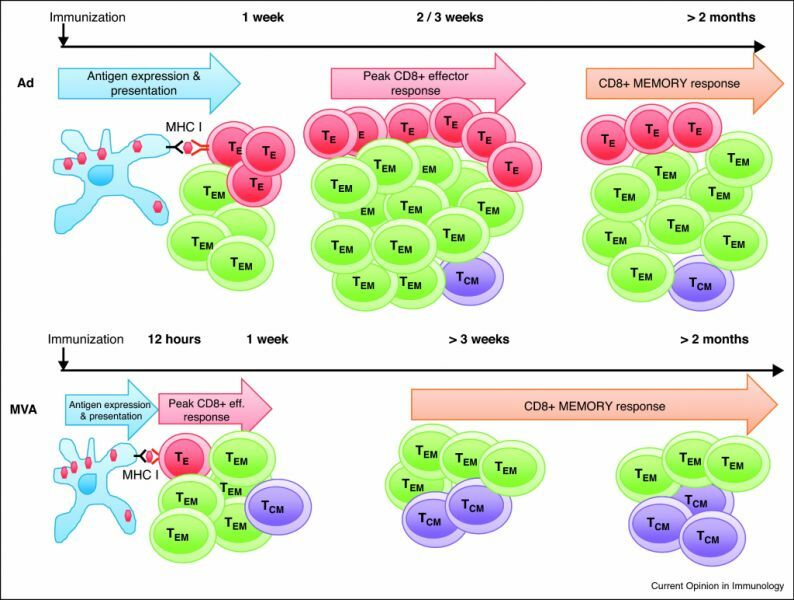 By classifying CD8(+) T cells into effector, effector memory (T(EM)), and central memory subsets using CD62L and CD127 markers, we found striking differences in T cell memory generation. Although MVA induced accelerated central memory T cell generation, which could be efficiently boosted by subsequent Ad administration, it failed to protect against malaria. In contrast, Ad vectors, which permit persistent Ag delivery, elicit a prolonged effector T cell and T(EM) response that requires long intervals for an efficient boost. A preferential T(EM) phenotype was maintained in liver, blood, and spleen after Ad/MVA prime-boost regimens, and animals were protected against malaria sporozoite challenge. Blood CD8(+) T(EM) cells correlated with protection against malaria liver-stage infection, assessed by estimation of number of parasites emerging from the liver into the blood. The protective ability of Ag-specific T(EM) cells was confirmed by transfer experiments into naive recipient mice. Thus, we identify persistent CD8 T(EM) populations as essential for vaccine-induced pre-erythrocytic protection against malaria, a finding that has important implications for vaccine design. A little more than a decade after the explosion of research into recombinant live-attenuated or replication-deficient viruses as vaccine platforms, many viral vector-based vaccines have been licensed for animals. Progress has been slower for humans but 2011 will see the licensure of the first viral-vectored vaccine for humans, against Japanese Encephalitis. In addition a vaccine with a viral-vectored component showed efficacy against HIV infection in humans. Viral-based vaccines have an excellent safety profile but must deal with the potential problem of pre-existing anti-vector immunity. Recent successes reflect diverse improvements such as development of new adenovirus serotypes and better prime-boost approaches, suggesting that many viral vectors are approaching their final years as vaccine 'candidates' rather than vaccines. © 2011 Elsevier Ltd.
A little more than a decade after the explosion of research into recombinant live-attenuated or replication-deficient viruses as vaccine platforms, many viral vector-based vaccines have been licensed for animals. Progress has been slower for humans but 2011 will see the licensure of the first viral-vectored vaccine for humans, against Japanese Encephalitis. In addition a vaccine with a viral-vectored component showed efficacy against HIV infection in humans. Viral-based vaccines have an excellent safety profile but must deal with the potential problem of pre-existing anti-vector immunity. Recent successes reflect diverse improvements such as development of new adenovirus serotypes and better prime-boost approaches, suggesting that many viral vectors are approaching their final years as vaccine 'candidates' rather than vaccines. Kaur R, Milicic A, Reyes-Sandoval A, Hill A, Perrie Y. 2010. Addition of immunostimulatory components to DDA-TDB adjuvant delivery system	JOURNAL OF PHARMACY AND PHARMACOLOGY,	62	(10),	pp. 1245-1246. The difficulty of inducing protective immunity through antibodies against sporozoites led to efforts to assess vectored vaccines as a means of inducing protective T-cell immunity against the malaria liver-stage parasite. Although DNA vectored vaccines used alone were poorly immunogenic and not protective, high levels of parasite clearance in the liver has been achieved with viral vectored vaccines used in heterologous prime-boost regimes. Such vectored vaccination regimes represent one of only two approaches that have induced repeatable partial efficacy in human P. falciparum subunit vaccine trials. Interestingly, vectors expressing the TRAP antigen have been consistently been more immunogenic and protective than vectors expressing the circumsporozoite protein in human trials. However, sterile protection requires induction of very potent T-cell responses that are currently only achievable with heterologous prime-boost regimes. Recently, simian adenoviruses have been assessed as priming agents in Adenovirus-MVA regimes in both phase I and phase IIa trials in the UK, based on very promising pre-clinical results showing better immunogenicity and efficacy than previous prime-boost regimes. The same vectors are also being assessed clinically expressing blood-stage antigens, attempting to induce both protective antibodies and T cells as recently demonstrated in murine efficacy studies. These viral vectors now provide a major option for inclusion in a high efficacy multi-stage malaria vaccine that should achieve deployable levels of efficacy in endemic settings. Protection against liver-stage malaria relies on the induction of high frequencies of antigen-specific CD8+ T cells. We have previously reported high protective levels against mouse malaria, albeit short-lived, by a single vaccination with adenoviral vectors coding for a liver-stage antigen (ME.TRAP). Here, we report that prime-boost regimens using modified vaccinia virus Ankara (MVA) and adenoviral vectors encoding ME.TRAP can enhance both short- and long-term sterile protection against malaria. Protection persisted for at least 6 months when simian adenoviruses AdCh63 and AdC9 were used as priming vectors. Kinetic analysis showed that the MVA boost made the adenoviral-primed T cells markedly more polyfunctional, with the number of gamma interferon (INF-gamma), tumor necrosis factor alpha (TNF-alpha), and interleukin-2 (IL-2) triple-positive and INF-gamma and TNF-alpha double-positive cells increasing over time, while INF-gamma single-positive cells declined with time. However, IFN-gamma production prevailed as the main immune correlate of protection, while neither an increase of polyfunctionality nor a high integrated mean fluorescence intensity (iMFI) correlated with protection. These data highlight the ability of optimized viral vector prime-boost regimens to generate more protective and sustained CD8+ T-cell responses, and our results encourage a more nuanced assessment of the importance of inducing polyfunctional CD8(+) T cells by vaccination. Malaria is a major health problem as nearly half of the human population is exposed to this parasite causing around 600 million clinical cases annually. Prime-boost regimes using simian adenoviral vectors and MVA expressing the clinically relevant Plasmodium falciparum ME.TRAP antigen have shown outstanding protective efficacy in mouse models. We now extend those observations to macaque monkeys. Immunisation with AdCh63 elicited a median response of 869 IFN-γ SFC/million PBMCs to ME.TRAP and responses were boosted by MVA to reach 5256 SFC/million PBMCs, increasing at the same time the breadth of the T cell responses to cover the complete ME.TRAP antigen. Intramuscular vaccination was more immunogenic than the intradermal route, and MVA could be used repeatedly for up to 3 times to boost adenovirus-primed responses. An interval of 16 weeks between repeated MVA injections was optimal to enhance cytokine production by T cells and improve the CD8 multifunctional responses. Antibodies to TRAP were exceptionally high and maintained for a long period of time after the prime-boost regime. These results in non-human primates highlight the potential of this vaccination regime and encourage its future use in clinical trials. Malaria is a major health problem as nearly half of the human population is exposed to this parasite causing around 600 million clinical cases annually. Prime-boost regimes using simian adenoviral vectors and MVA expressing the clinically relevant Plasmodium falciparum ME.TRAP antigen have shown outstanding protective efficacy in mouse models. We now extend those observations to macaque monkeys. Immunisation with AdCh63 elicited a median response of 869 IFN-γ SFC/million PBMCs to ME.TRAP and responses were boosted by MVA to reach 5256 SFC/million PBMCs, increasing at the same time the breadth of the T cell responses to cover the complete ME.TRAP antigen. Intramuscular vaccination was more immunogenic than the intradermal route, and MVA could be used repeatedly for up to 3 times to boost adenovirus-primed responses. An interval of 16 weeks between repeated MVA injections was optimal to enhance cytokine production by T cells and improve the CD8 multifunctional responses. Antibodies to TRAP were exceptionally high and maintained for a long period of time after the prime-boost regime. These results in non-human primates highlight the potential of this vaccination regime and encourage its future use in clinical trials. © 2010 Elsevier Ltd. The complex life cycle of the malaria parasite involves several developmental stages in the mammalian host that provide opportunities for vaccine intervention. The effector arm of the immune response that protects against malaria is specific for each stage of the parasite life cycle. While CD4+ and CD8+ T-cells are required to mediate protection during the liver stage, antibodies play a major role before parasite entry into the liver and during the blood stage. Induction of cytotoxic T-cells or those producing IFNgamma has become a major goal for T-cell-inducing vaccines, and the liver stage is currently one of the preferred targets for malaria vaccine development. T-cells can effectively be primed by several vaccine strategies, including recombinant vectors. A wide range of such vectors is currently available and their use alone or in combination induces high frequencies of antigen-specific T-cells in animal models and humans. Therefore, traditional potency assays, such as the highly sensitive ex vivo and cultured ELISPOT, are being complemented by less sensitive, but more flexible techniques, such as flow cytometry, which allows characterization of multifunctional antigen-specific T-cells following vaccination. 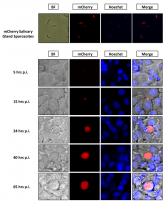 Infection of mice with sporozoites of Plasmodium berghei or Plasmodium yoelii has been used extensively to evaluate liver-stage protection by candidate preerythrocytic malaria vaccines. Unfortunately, repeated success of such vaccines in mice has not translated readily to effective malaria vaccines in humans. Thus, mice may be used better as models to dissect basic parameters required for immunity to Plasmodium-infection than as preclinical vaccine models. In turn, this basic information may aid in the rational design of malaria vaccines. Here, we describe a model of circumsporozoite-specific memory CD8 T cell generation that protects mice against multiple P. berghei sporozoite challenges for at least 19 months. Using this model we defined a threshold frequency of memory CD8 T cells in the blood that predicts long-term sterilizing immunity against liver-stage infection. Importantly, the number of Plasmodium-specific memory CD8 T cells required for immunity greatly exceeds the number required for resistance to other pathogens. In addition, this model allowed us to identify readily individual immunized mice that exceed or fall below the protective threshold before infection, information that should greatly facilitate studies to dissect basic mechanisms of protective CD8 T cell memory against liver-stage Plasmodium infection. Furthermore, the extremely large threshold in memory CD8 T cell frequencies required for long-term protection in mice may have important implications for development of effective malaria vaccines. Human adenovirus serotype 5 (AdH5) vector vaccines elicit strong immune responses to the encoded antigen and have been used in various disease models. We designed AdH5 vectors expressing antigen under the control of a human cytomegalovirus (HCMV) immediate-early promoter containing its intron A sequence. The transcriptional levels of antigen and immune responses to antigen for vectors with the HCMV promoter with the intron A sequence (LP) were greater than those for AdH5 vectors using the HCMV promoter sequence without intron A (SP). We compared an E1E3-deleted AdH5 adenoviral vector, which affords more space for insertion of foreign sequences, and showed it to be as immunogenic as an E1-deleted AdH5 vector. Neutralizing antibodies to AdH5 limit the efficacy of vaccines based on the AdH5 serotype, and simian adenoviral vectors offer an attractive option to overcome this problem. We constructed E1E3-deleted human and simian adenoviral vectors encoding the pre-erythrocytic-stage malarial antigen Plasmodium berghei circumsporozoite protein. We compared the immunogenicity and efficacy of AdC6, a recombinant simian adenovirus serotype 6 vector, in a murine malaria model to those of AdH5 and the poxviral vectors MVA and FP9. AdC6 induced sterile protection from a single dose in 90% of mice, in contrast to AdH5 (25%) and poxviral vectors MVA and FP9 (0%). Adenoviral vectors maintained potent CD8(+) T-cell responses for a longer period after immunization than did poxviral vectors and mainly induced an effector memory phenotype of cells. Significantly, AdC6 was able to maintain protection in the presence of preexisting immunity to AdH5. Simian adenoviral vectors (SAd) offer an attractive alternative to standard human adenovirus serotype 5 (AdH5) subunit vaccination, due to pre-existing immunity affecting vaccine performance. We have used a mouse model of liver-stage malaria to test the efficiency of three chimpanzee-origin adenoviral vectors, AdC6, AdC7 and AdC9 containing ME.TRAP as an insert. AdC7 and AdC9 elicited strong immunogenicity ( approximately 20% of CD8(+) T cells in spleen), equivalent to or outperforming AdH5 and inducing sterile protection in 92% (C9), 83% (H5 and C7) and 67% (C6) of the mice, providing the first evidence of single-dose protection to Plasmodium berghei. Protection was afforded by the SAd despite high levels of pre-existing immunity to AdH5. Phenotypic analysis showed that all adenoviral vectors (Ad) elicited CD8(+) T cell responses with an effector memory T cell (T(EM)) phenotype. By contrast, vaccination with poxviral vectors did not confer protection to P. berghei and induced a predominantly CD8(+) central memory T cell (T(CM)) response. Multifunctional CD8(+) T cell responses (co-expressing IFN-gamma, TNF-alpha and IL-2) were also induced by the Ad in higher percentages than the poxviral vectors. Our data suggest that T(EM) cells are important as a first line of defense against fast-replicating pathogens such as murine Plasmodium and demonstrate the potential of replication-defective SAd as future malaria vaccines for humans. Vaccines that comprise attenuated viral vectors encoding antigens from target pathogens generate potent T-cell responses. One such pathogen is malaria, and in particular the liver stage of its life cycle. Immunogenicity and efficacy studies in animals and humans have revealed the generation of memory T cells of both the central and effector phenotypes, depending on the viral vectors used in the malaria vaccination regime (viral species and serotype, combination and sequence for prime-boost) and suggest a divergence in their protective role. Being able to influence the memory T-cell make-up in a rational manner may allow us to develop more efficacious vaccines. CD8(+) T cell-numbers rapidly expand and then contract after exposure to their cognate antigen. Here we show that the sustained frequencies of transgene product-specific CD8(+) T cells elicited by replication-defective adenovirus vectors are linked to persistence of low levels of transcriptionally active adenovirus vector genomes at the site of inoculation, in liver, and lymphatic tissues. Continuously produced small amounts of antigen maintain fully active effector CD8(+) T cells, while also allowing for their differentiation into central memory cells. 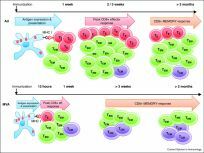 The long-term persistence of adenoviral vectors may be highly advantageous for their use as vaccines against pathogens for which T-cell-mediated protection requires both fully activated T cells for immediate control of virus-infected cells and central memory CD8(+) T cells that, because of their higher proliferative capacity, may be suited best to eliminate cells infected by pathogens that escaped the initial wave of effector T cells. Reyes-Sandoval A, Sridhar S, Moore AC, Gilbert SC, Gao G, Wilson JM, Hill AV. 2005. Immunogenicity of a pre-erythrocytic-stage malaria insert ME-trap encoded by novel simian adenoviral vectors	IMMUNOLOGY,	116	pp. 46-46. Vaccine approaches to infectious diseases are widely applied and appreciated. Amongst them, vectors based on recombinant viruses have shown great promise and play an important role in the development of new vaccines. Many viruses have been investigated for their ability to express proteins from foreign pathogens and induce specific immunological responses against these antigens in vivo. Generally, gene-based vaccines can stimulate potent humoral and cellular immune responses and viral vectors might be an effective strategy for both the delivery of antigen-encoding genes and the facilitation and enhancement of antigen presentation. In order to be utilized as a vaccine carrier, the ideal viral vector should be safe and enable efficient presentation of required pathogen-specific antigens to the immune system. It should also exhibit low intrinsic immunogenicity to allow for its re-administration in order to boost relevant specific immune responses. Furthermore, the vector system must meet criteria that enable its production on a large-scale basis. Several viral vaccine vectors have thus emerged to date, all of them having relative advantages and limits depending on the proposed application, and thus far none of them have proven to be ideal vaccine carriers. In this review we describe the potential, as well as some of the foreseeable obstacles associated with viral vaccine vectors and their use in preventive medicine. DNA vaccines encoding the human papillomavirus type-16 (HPV-16) E6 and E7 oncoproteins genetically fused to the human herpes simplex virus type 1 (HSV-1) gD protein were tested in mice for induction of T cell-mediated immunity and protection against tumor cell challenge. Hybrid genes, generated after insertion of E6 or E7-encoding sequences into internal sites of the gD-encoding gene, were transcribed in vitro and the chimeric proteins were expressed at the surface of in vitro-transfected mammalian cells. Female C57BL/6 mice immunized with 4 intramuscular doses (100 microg of DNA/dose) of the DNA vaccines encoding E7 efficiently generated E7-specific CD8(+) T cells. Vaccination of mice with the DNA vaccines encoding the E7, or both E6 and E7, conferred complete protection to challenges from TC-1 tumor cells and partial therapeutic effect (40%) in mice inoculated with TC-1 cells on the same day or 5 days prior to the first vaccine dose. Two triple immunization vaccine regimens with adenoviral vectors with E1 deleted expressing Gag of human immunodeficiency virus type 1 were tested for induction of T- and B-cell-mediated-immune responses in mice and in nonhuman primates. The vaccine carriers were derived from distinct serotypes of human and simian adenoviruses that fail to elicit cross-neutralizing antibodies expected to dampen the effect of booster immunizations. Both triple immunization regimens induced unprecedented frequencies of gamma interferon-producing CD8(+) T cells to Gag in mice and monkeys that remained remarkably stable over time. In addition, monkeys developed Gag-specific interleukin-2-secreting T cells, presumably belonging to the CD4(+) T-cell subset, and antibodies to both Gag and the adenoviral vaccine carriers. Gene therapy has the potential to cure inherited diseases if the delivered genes achieve long-term expression at therapeutic levels in the targeted tissues. Expression is commonly short-lived due to induction of cell-mediated immune responses to the gene therapy vehicle and/or the transgene product, which can be perceived as "foreign" by the host's immune system. Plasmid expression vectors have been used to deliver genes. Bacterial DNA carries immunostimulatory sequences in the form of unmethylated CpG motifs, which induce an inflammatory reaction that in turn promotes activation of transgene product-specific B and T cells. Elimination or methylation of immunostimulatory CpG sequences in plasmid expression vectors prevents the stimulation of transgene product-specific immune responses without necessarily reducing transgene expression. In this study, we tested if a CpG-methylated plasmid expression vector expressing the highly immunogenic glycoprotein of rabies virus can achieve prolonged transgene product expression by circumventing immune recognition. Our data show that mice inoculated with a CpG-methylated plasmid expression vector show delayed clearance of transfected cells and fail to mount a strong immune response to the transgene product. Gene transfer with a CpG-methylated plasmid results in a state of immunological low responsiveness to the transgene product, which may facilitate readministration of the transgene. Nevertheless, mice remain responsive to the transgene product delivered by a viral vector. An adaptive immune response is initiated by mature dendritic cells presenting processed antigen to nai;ve T cells. Assuming that the magnitude of the immune response is influenced by the number and type of antigen-presenting dendritic cells and by the duration of antigen presentation, we tested if chemokines that bind to receptors expressed on immature dendritic cells or TRANCE, a survival factor for mature dendritic cells, can serve as adjuvants. None of the immunomodulaters given as genetic adjuvants with a DNA vaccine encoding the full-length rabies virus glycoprotein augmented the transgene product-specific response. However, RANTES, MCP-1, MIP 1-beta, and TRANCE given together with a DNA vaccine expressing a truncated and thus secreted version of the rabies virus glycoprotein enhanced the response suggesting that the tested genetic adjuvants promoted preferentially presentation of reprocessed antigen originating from transduced tissue cells. In animal models, E1-deleted human adenoviral recombinants of the serotype 5 (AdHu5) have shown high efficacy as vaccine carriers for different Ags including those of HIV-1. Humans are infected by common serotypes of human adenovirus such as AdHu5 early in life and a significant percentage has high levels of neutralizing Abs to these serotypes, which will very likely impair the efficacy of recombinant vaccines based on the homologous virus. To circumvent this problem, a novel replication-defective adenoviral vaccine carrier based on an E1-deleted recombinant of the chimpanzee adenovirus 68 (AdC68) was developed. An AdC68 construct expressing a codon-optimized, truncated form of gag of HIV-1 induces CD8(+) T cells to gag in mice which at the height of the immune response encompass nearly 20% of the entire splenic CD8(+) T cell population. The vaccine-induced immune response provides protection to challenge with a vaccinia gag recombinant virus. Induction of transgene-specific CD8(+) T cells and protection against viral challenge elicited by the AdC68 vaccines is not strongly inhibited in animals preimmune to AdHu5 virus. However, the response elicited by the AdHu5 vaccine is greatly attenuated in AdHu5 preimmune animals. An adaptive immune response is initiated by mature dendritic cells presenting processed antigen to naïve T cells. Assuming that the magnitude of the immune response is influenced by the number and type of antigen-presenting dendritic cells and by the duration of antigen presentation, we tested if chemokines that bind to receptors expressed on immature dendritic cells or TRANCE, a survival factor for mature dendritic cells, can serve as adjuvants. None of the immunomodulaters given as genetic adjuvants with a DNA vaccine encoding the full-length rabies virus glycoprotein augmented the transgene product-specific response. However, RANTES, MCP-1, MIP 1-β, and TRANCE given together with a DNA vaccine expressing a truncated and thus secreted version of the rabies virus glycoprotein enhanced the response suggesting that the tested genetic adjuvants promoted preferentially presentation of reprocessed antigen originating from transduced tissue cells. © 2003 Elsevier Inc. All rights reserved. An E1-deletion-containing adenoviral recombinant based on the chimpanzee serotype 68 (AdC68) was developed to express the rabies virus glycoprotein. Mice immunized with this construct (AdC68rab.gp) developed antibodies to rabies virus and remained resistant to challenge with an otherwise lethal dose of rabies virus. In naïve mice immunized intranasally, the rabies virus-specific antibody responses elicited by AdC68rab.gp were comparable with regard to both titers and isotype profiles to those induced by an adenoviral recombinant based on human serotype 5 (Adhu5) expressing the same transgene product. In contrast, subcutaneous immunization with the AdC68rab.gp vaccine resulted in markedly lower antibody responses to the rabies virus glycoprotein than the corresponding Adhu5 vaccine. Antibodies from AdC68rab.gp-immunized mice were strongly biased towards the immunoglobulin G2a isotype. The antibody response to the rabies virus glycoprotein presented by Adhu5rab.gp was severely compromised in animals preexposed to the homologous adenovirus. In contrast, the rabies virus-specific antibody response to the AdC68rab.gp vaccine was at most marginally affected by preexisting immunity to common human adenovirus serotypes, such as 2, 4, 5, 7, and 12. This novel vaccine carrier thus offers a distinct advantage over adenoviral vaccines based on common human serotypes. Within the last decade bacterial plasmids encoding foreign antigens have revolutionized vaccine design. Although no DNA vaccine has yet been approved for routine human or veterinary use, the potential of this vaccine modality has been demonstrated in experimental animal models. Plasmid DNA vaccination has shown efficacy against viral, bacterial and parasitic infections, modulated the effects of autoimmune and allergic diseases and induced control over cancer progression. With a better understanding of the basic immune mechanisms that govern induction of protective or curative immune responses, plasmid DNA vaccines and their mode of delivery are continuously being optimized. Because of the simplicity and versatility of these vaccines, various routes and modes of delivery are possible to engage the desired immune responses. These may be T or B effector cell responses able to eliminate infectious agents or transformed cells. DNA vaccines may also induce an immunoregulatory/modulatory or immunosuppressive (tolerizing) response that interferes with the differentiation, expansion or effector functions of B and T cells. In this sense a DNA vaccine may be thought of as a 'negative' vaccine. Pre-clinical and initial small-scale clinical trials have shown DNA vaccines in either of these modes to be safe and well tolerated. Although DNA vaccines induce significant immune responses in small animal trials their efficacy in humans has so far been less promising thus necessitating additional optimizations of this novel vaccine approach. Chikungunya virus (CHIKV) has caused extensive outbreaks in several countries within the Americas, Asia, Oceanic/Pacific Islands, and Europe. In humans, CHIKV infections cause a debilitating disease with acute febrile illness and long-term polyarthralgia. Acute and chronic symptoms impose a major economic burden to health systems and contribute to poverty in affected countries. An efficacious vaccine would be an important step towards decreasing the disease burden caused by CHIKV infection. Despite no licensed vaccine is yet available for CHIKV, there is strong evidence of effective asymptomatic viral clearance due to neutralising antibodies against the viral structural proteins. We have designed viral-vectored vaccines to express the structural proteins of CHIKV, using the replication-deficient chimpanzee adenoviral platform, ChAdOx1. Expression of the CHIKV antigens results in the formation of chikungunya virus-like particles. Our vaccines induce high frequencies of anti-chikungunya specific T-cell responses as well as high titres of anti-CHIKV E2 antibodies with high capacity for in vitro neutralisation. Our results indicate the potential for further clinical development of the ChAdOx1 vaccine platform in CHIKV vaccinology.